We did a colour hunt for the colour blue. R is not yet at the developmental stage where she gets what a colour hunt is, so we did an adapted version of this. Using a wooden bowl, rice and a mix of blue items and very few yellow and red items, we did a mini colour hunt. R loved to dig out items and swirl the rice around the bowl using a popsicle stick she dug up. Any time she pulled out a blue item, I would say blue and we would cheer. Any time she pulled out a different coloured item, I’d say the colour and then put it back in the bowl. Since there were way more blue items, we did lots of cheering! Despite taking a number of breaks between activities, R was uninterested in continuing. 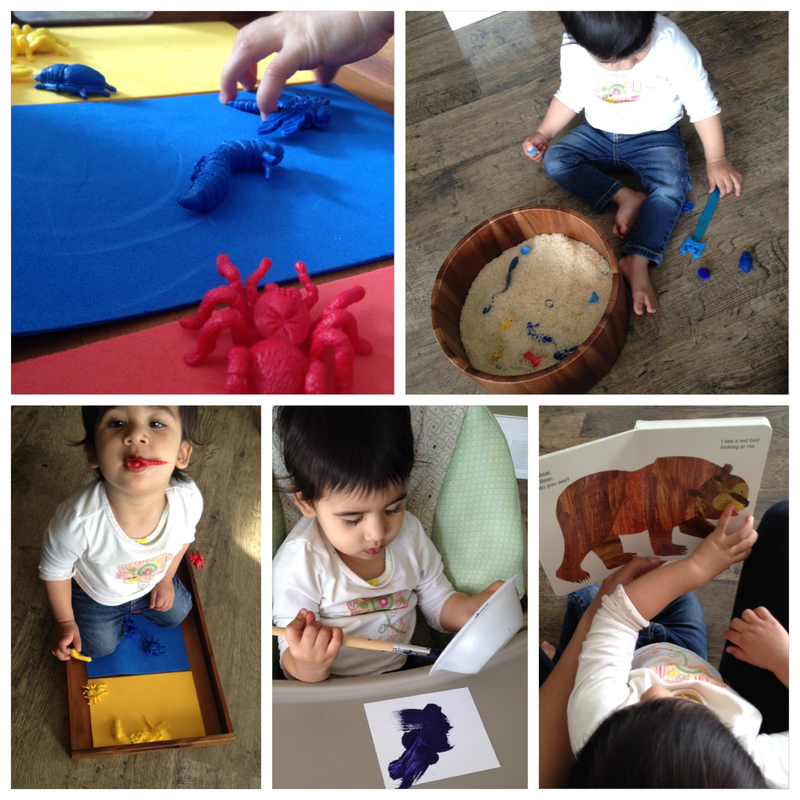 When I pulled out the wooden tray with coloured mats and matching bugs, she grabbed some bugs, stuck them in her mouth and sat on the tray! So silly! She was dying for independent play time, so I put away the activities and let her at it!